I have been making this salad for years and it's my go to salad to bring to cookouts. Everyone loves it and if by chance there is any leftover, it's good the next day. There are a lot of different recipes out there for this salad and I've settled on this one because it's not overdressed and is a perfect balance of crunchy, sweet and salty. 1. 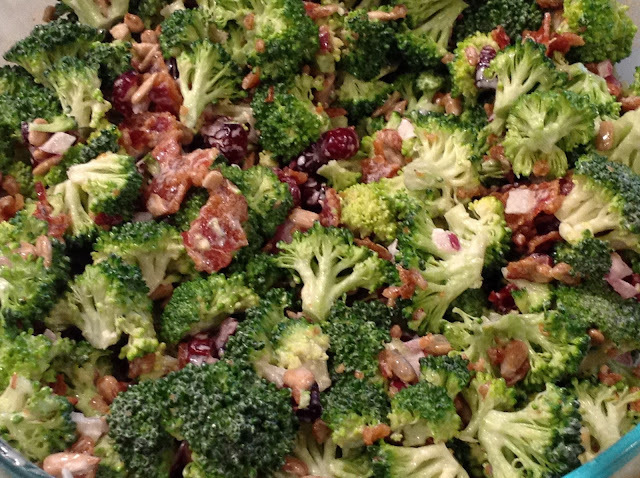 Combine broccoli (and cauliflower if using), bacon, onion, sunflower seeds and cranberries in a large bowl. 2. In a small bowl whisk mayo, vinegar sugar, salt and pepper. Pour dressing over salad and toss to coat. 3. Cover and refrigerate (at least an hour) until ready to serve.